"Every building tells a story, of booms or bust, triumphs or defeats, and most of all, the pioneering spirit of this city's citizens: architects, designers, artists, developers, and builders, forever determined to make New York the biggest, brightest, and most beautiful city on earth," it says on these cards. I'm inclined to agree. It's a fascinating and alluring city both to live in or to visit, as it's full of the every old, the very new, and everything in between. These twenty five walks each last about one to two hours, longer if you linger, and also point out places to eat and drink and stores that may be of interest along the way. The obvious though, is what's to see architecturally, and there is a lot, so plan your tours carefully as some of them can be combined with others. You can plan to be out all day instead of just for a couple of hours if you prefer. All tours start and end at a subway station (do use the buses as well, especially if you're strapped for time, as you'll see so much more). Some of the sights featured in this deck include the Brooklyn Bridge, the World Trade Center Site, Art Deco at Rockefeller Center, Window Shopping on Fifth Avenue, Upper East Side Palaces of Art and Design, Central Park, Harlem Revival, and Brooklyn's Brownstones. Each card is a double card and features a photo, two "pages" of information, and a map. Easy to take along on your tour. Whether you're after funky, fun, serious, light-hearted, traditional, eye-opening, or whatever else takes your fancy, you're bound to come across it in New York City. Per the theme of these cards, you'll enjoy much of the celebrated works of noted architects, and get to see the Hearst Tower, the Empire State Building, the New York Stock Exchange, the Woolworth Building, Grand Central Station, the Puck Building, the New Museum, the Westin Hotel, the Metropolitan Museum of Art, the Dakota Building, and the Belvedere Castle in Central Park. Don't forget the fabulous Victorian and Queen Anne houses on Staten Island. 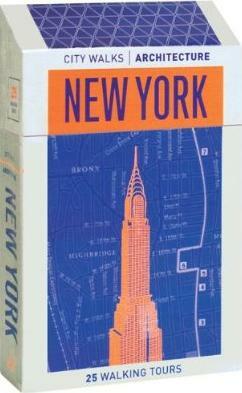 Conclusion - A fantastically easy way to plan a trip to New York City and the surrounding burroughs. What a great idea!